MMC is the world’s leading manufacturer of portable instruments for measuring ullage, oil-water interface, temperature, and bottom dryness in shipboard and land-based petroleum and chemical tank systems. All MMC systems are manufactured in the United States and are certified as intrinsically safe by Factory Mutual, BASEEFA, CSA and SAA. The Portable Closed Flexi-Dip measuring tape is a battery-operated electronic unit that is totally gas-tight. When installed in a vapor-control valve mounted on a storage (cargo) tank, it forms a tightly sealed system that prevents toxic vapors from escaping and creates a closed gauging system for that tank. The tape is marked in metric or english units and is anti-static coated (as is the sensor). In addition, the tape is color marked to make tape direction and motion easily seen and to ensure full rewind position. A coiled grounding cable with large alligator clip is standard. 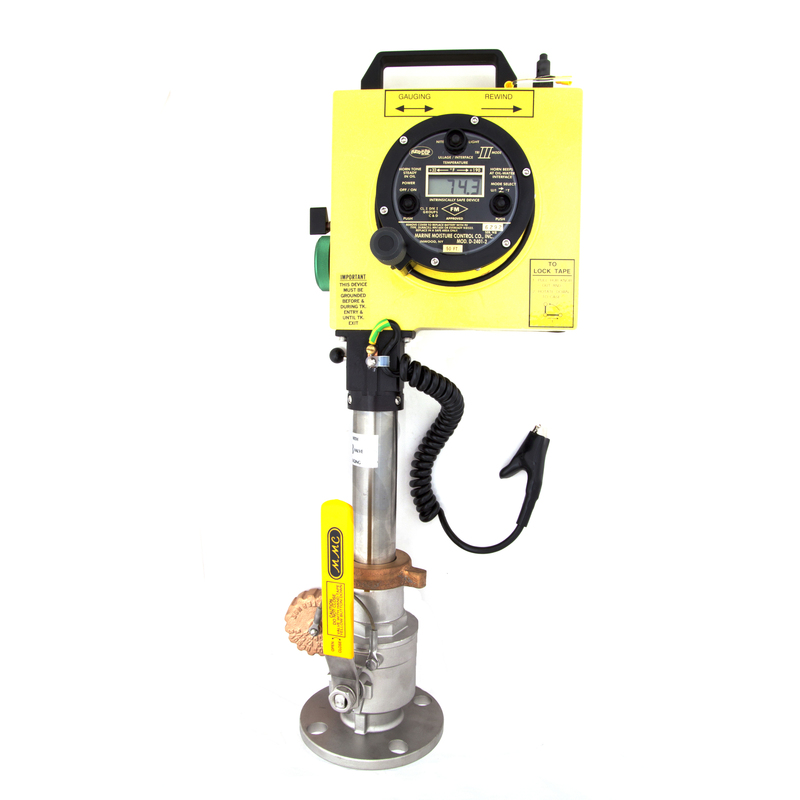 This closed system is recognized by many worldwide regulatory bodies as equivalent to a fixed gauging system as long as the tape remains in the valve from the beginning until the end of loading or discharging of the tank. Accuracy of Tape Reading: Fluid level +/- 1/8 inch (3mm), +/- 0.01% of F.S. tape LGT (F.S. = Full Scale). Accuracy of Temperature Display: +/- 0.5 °F (+/- 0.3 °C), +/- 1 digit error. Tape Lengths: 50 ft. (15m), 75 ft. (25m), 100 ft. (30M). Approvals: Intrinsically safe–FM, BASEEFA, CSA, SAA, NKK (Japan). Please note that when purchasing adapters, the tri-mode gauging unit must be supplied with the Standard B barrel as these adapters convert from the gauge height of the B barrel.